In 1929, famed artist Salvador Dalí and filmmaker Luis Buñuel awoke from a night of strange dreams, Buñuel recalling the image of a razor blade cloud slicing through the moon as if it were an eyeball, and Dalí describing a human hand covered in ants. They turned these images into a silent, surrealist short film called Un Chien Andalou, which opens on a woman with one eye held open, a cloud cutting across the moon and a blade slicing through the eye of a dead calf. The hand, crawling with ants, also makes an appearance. The film has no plot, but it's rife with emotive and disturbing imagery. 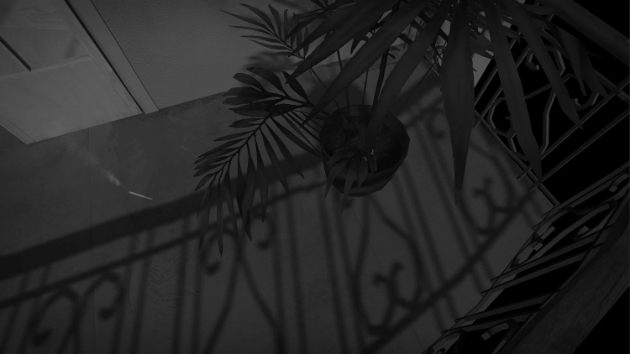 Cut to 2014, when Russian game developers Ilya Kononenko and Yuliya Kozhemyako decided the first scene of Un Chien Andalou would make the perfect setting for their entry in a local game jam with the theme "Phobias." Their completed game is now due out on April 3rd, called The Tender Cut. "We want players to dive into a surrealistic dream, where emotions overlap each other -- disgust and arousal, fear and curiosity," Kononenko and Kozhemyako say in an email. "The game contains a set of tiny experiences, and everyone has a chance to get at least one of them." Like its source material, The Tender Cut doesn't provide a clear path forward. There are no instructions and the game takes place in a sparsely furnished, black-and-white room. It's first-person, allowing players to directly interact with various objects, including a tube TV set playing bits of Un Chien Andalou, a cigarette, a lighter, a razor and a few crooked paintings hiding creepy secrets. The moon beyond the balcony winks down on a potted plant that has something other than roots buried in its soil. Kononenko and Kozhemyako say The Tender Cut is a game, though just barely. It's short -- roughly 20 minutes long -- and early in development they called it an "interactive installation." Now, it's an exploration game, even though there are no "right" actions and only a vague sense of winning or losing. After observing the confusion of beta players, the developers added two different endings, new cursors and some achievements to make it more approachable as a game. "An interactive format makes you an actor instead of viewer," they say. "It makes it possible to experience the scene from the other side and get another emotional message." "We want players to dive into a surrealistic dream, where emotions overlap each other -- disgust and arousal, fear and curiosity." "And this is not about industry in Russia separately; it's more about [the Russian-speaking] industry. A lot of events are based in Kiev and Minsk; we have many friends and colleagues from Ukraine and Belarus. There are strong communities in Twitter and other media resources. It is not so good with game journalism here. There are some major titles which write about mainstream games, but more specific products are not covered well enough." Art-house games about classic, creepy, surrealist films do indeed inhabit a specific category. The Tender Cut will be available for download on April 3rd via its official site; feel free to take a few days to mentally prepare.